Â Â Great, sturdy chairs! Incredible value for how well made they are. They are strong and comfortable. I am a Great Grandma and I was able to put them together by myself. I would highly recommend them. Â Â Restoration Hardware Dining Table, but didn't want to spend all that money paying for their chairs. They look fine with my new table. Super sturdy, high-quality chairs. Very pleasantly surprised with the quality. 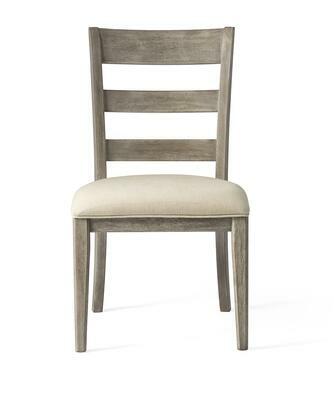 Â Â I ordered these chairs for our big wood dining table. They are awesome. Surprisingly, the chairs were packed so well they weren't damaged nor wet. Have had for a few months now and they seem very durable. Â Â They are very comfortable to sit in with a conformed seat. I read a lot of the reviews before I ordered, very helpful. I ordered 4 of these chairs to go with my big farm house table and bench, and I cannot even begin to tell you how much I LOVE them and how well they are made. Â Â I had no problems with damage or wobbling like you hear about in allot of chairs. Look just like the pictures. The seat is extra wide so it would be good for anyone that may be a bit larger. So excited to finally use these chairs this weekend family dinner. Got these Bellamy Collection chairs from Bassett Mirror to go with an antique table that I already have, can't believe how well they match. They not only match color wise, but they update the whole look of the dining room.